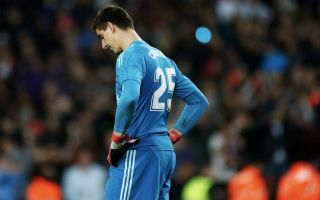 Real Madrid star Thibaut Courtois has received support from his father who has blasted the media’s criticism and scrutiny of his son. The 26-year-old secured a move to the Spanish capital from Chelsea last summer, but has gone on to keep just 10 clean sheets in 32 games so far this season, conceding 42 goals. Los Blancos have crashed out of both the Copa del Rey and Champions League this month, while they sit 12 points behind La Liga leaders Barcelona. With all that in mind coupled with Julen Lopetegui and Santiago Solari both being sacked, it has been a disastrous campaign for all concerned. However, Courtois’ dad has now spoken out over the treatment the goalkeeper gets from the media, and believes that it’s unfair and unjustified in terms of the level of criticism and scrutiny that the Belgian international is coming under. “I feel that everyone is targeting Thibaut. The Spanish press, and also the Flemish. As a father, I can not ignore that,” he told HLN. “A goalkeeper is always the first target, it is part of the job. For right or wrong, I let you judge that. “There are also personal things that come out in the press. I see the intentions of journalists to my son. I’m struggling with that, but luckily Thibaut is above that. Real Madrid will hope that the return of Zinedine Zidane this week now allows them to rediscover their belief and form in the closing weeks of the season, while a big summer transfer window could help Courtois and his teammates get back on track next year and begin to compete for major honours again. For now though, it seems Courtois will have to deal with the criticism that comes his way, and must continue to believe in his own ability to make a decisive difference for his teammates.